Breakfast. What is the first thing that comes to mind when you hear this word? For some people it’s pancakes or waffles, toast or bagels, bacon or sausages, oatmeal or porridge, fruit or green juices, yadda yadda. But honestly, it is just the first meal of the day to “break the body’s fast”–does it really needs its own category of dishes? For the most part, it doesn’t. However, who wouldn’t want to give up pancakes and waffles in the morning–unless you could have them for lunch and dinner, then I wouldn’t really question anything in that spectrum of American culture. Our nation does whatever it wants, and for some strange reason, a lot of other countries follow. Trust me, I’ve seen pancake stacks at Vietnamese restaurants. Speaking of which, I could TOTALLY use some savory tomato pancakes for dinner tonight. Anyways, speaking of making breakfast, here’s the thing about college life: the quarter system goes by in the blink of an eye–even faster, actually. And you basically have to have food on hand at every second because you never know when you’ll be swamped with work or errands to take care of. That’s why you’ll find that a lot of students resort to either making something out of the toaster, ordering from Starbucks or eating nothing at all until 12 P.M. when they can party. Many of them, however, are professional ramen or Nutella sandwich makers. In spite of my humility, I’ve been pretty stellar at keeping my diet in check the past week of college. Sure, I’ve only started my campus job plus classes for a little less than two weeks, but I refuse to see any signs of the Freshmen 15 any time in the future. To kick-start the “new year, new me” shizzle that everybody gets really deep into but bugs the living doodoo out of me, I will post a new dorm-friendly recipe post every month at the very latest! What you will also notice in terms of my format is that there are no longer any or at least looser suggestions of measurements. Any recipe college-related usually doesn’t allot the time to really structure any details. I mean come on, college life is busy. If you want to be successful in college and even life in general, you have to keep yourself busy. Obviously make sure you balance leisure, social life and me-time to stay sane, but life is going to demand that you get involved and figure out your niches. Anyways, my extremely local sources of sweet potatoes are quite limited here in San Luis Obispo. Sure I have the mediocre-orange sweet potatoes from Trader Joe’s, orange/white/purple/Japanese sweet potatoes from Whole Foods and seasonal varieties from the farmer’s market every Thursday. However, all of those sources require that I take a transit. Unless if it’s in the light of day, then no thanks. Luckily, buying tofu and vegetables only takes a 30-minute roundabout trip. Are you guessing what my new breakfast staple is? You can customize this tofu recipe to any way you wish. Ideally, if you want to avoid the Freshmen 15, smash in the greens, pile on the veggies, use less salt and refrain from extremely fattening sauces that can easily be overdone. Of course, this recipe isn’t even made only for vegans–carnivores can add anything they’d like too, from goat cheese to turkey sausage! Opt: nutritional yeast, garlic powder, curry powder, cayenne pepper, soy sauce, organic ketchup, etc. Split your vegetables and tofu in a separate bowl from those of your greens. Set aside the bowl of greens. Carefully mash your tofu wth a fork or even your hands until the pieces are completely scrambled. Mix your spices into the tofu and vegetables. Spread your greens, tofu and vegetables on a large plate. Microwave your scramble until you reach the desired heat. Garnish with some sauce and other spices and enjoy! Have you ever used a go-to college recipe? What are your best college food hacks? Yum! I’ve had tofu scrambles eating out before and they’re so delicious…like eggs, but somehow better. I’ve never tried making my own though, so I definitely need to try your recipe soon! 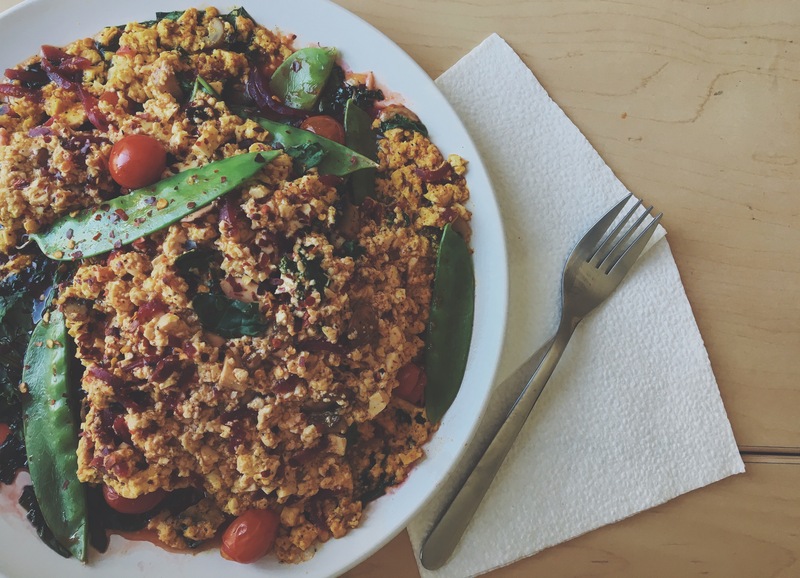 Not having a normal kitchen, just a microwave and a rice cooker in our dorm makes eating healthy sooo much more challenging so I always appreciate healthy dorm friendly ideas :)) And who doesn’t love a good tofu scramble?! Ah I’m so happy to hear! Thank you so much dear! ❤ I completely agree–I love tofu scrambles!